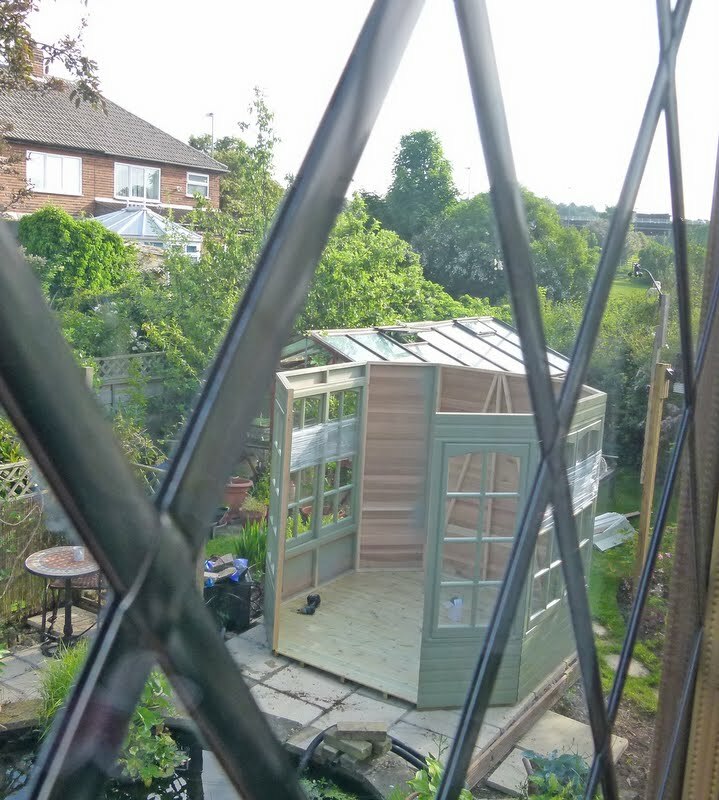 I promise that this blog isn't going to be all about the summerhouse but I thought I'd share part two of the summerhouse story with you. Now that the long anticipated summerhouse has arrived we didn't want to waste any time in starting to use it, so yesterday we set off to find some furniture. We were convinced that a couple of garden centres fairly near to us had lots of conservatory type furniture and so didn't anticipate a problem. How wrong could we be! Why is it that when you are actually looking for something all the masses of previously seen suitable items disappear? First stop had just a few pieces of furniture pushed together in a corner so it was quickly on to garden centre number two! More choice here but most of the chairs were too large - OK for a full sized conservatory but not suited to our needs. We didn't want the space to be filled completely by a couple of chairs and a table! There was just one set that we liked. We sat in the chairs and they were comfortable but I had expected to have been presented with a choice and didn't want just to buy the first thing that we saw. Third stop was the showroom of Burdekins which is only about a mile or so from home. This company specialises in cane, wicker and rattan furniture but didn't have anything that would fit the bill. In the end we decided to go back to garden centre number two and have another look at and sit in, and ponder the merits of the set that we saw there and liked. We reasoned that it would most likely have been sold when we returned so were pleased to see that the two chairs and table were sitting exactly where we had left them. So we looked at, sat in, and pondered and decided to buy. We found an assistant who informed us that the set wasn't in stock but that he would see whether he could order one for us. However on his return we were told that there were none to be had and this was a discontinued line but that we could have a small discount if we wanted to take the set on show. We did! On arrival home it was beginning to rain so we quickly installed the furniture in the summerhouse, made coffee and grabbed a paperback and a magazine, Result! It was just as we had imagined, sitting overlooking the pond sipping coffee as we watched the fish and a visiting frog swimming around, the rain creating circular ripples on the surface of the water. Then a relaxing read accompanied by the song of a blackbird. Now we need some greenery in there. 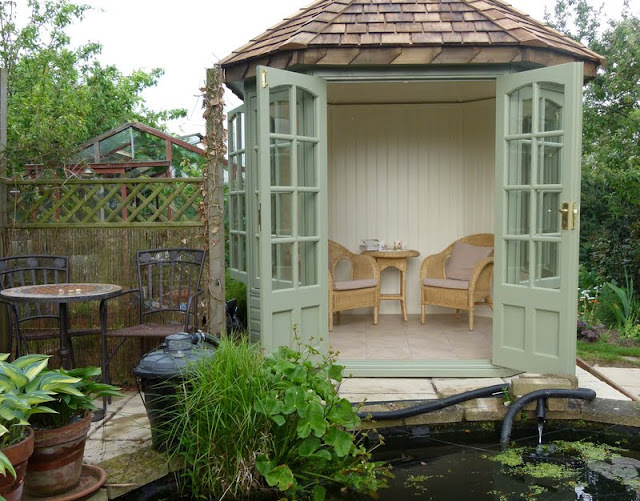 Something that will like being in a summerhouse during the summer months as well as during winter when there will be no heating. That back wall looks a bit plain doesn't it? Now what shall we do about that and ... oh yes ... we really need a doormat! PS: Don't worry that pond filter won't be a permanent feature - well not there anyway! Martyn and I usually try not to post about the same thing on the same day but today is the exception. 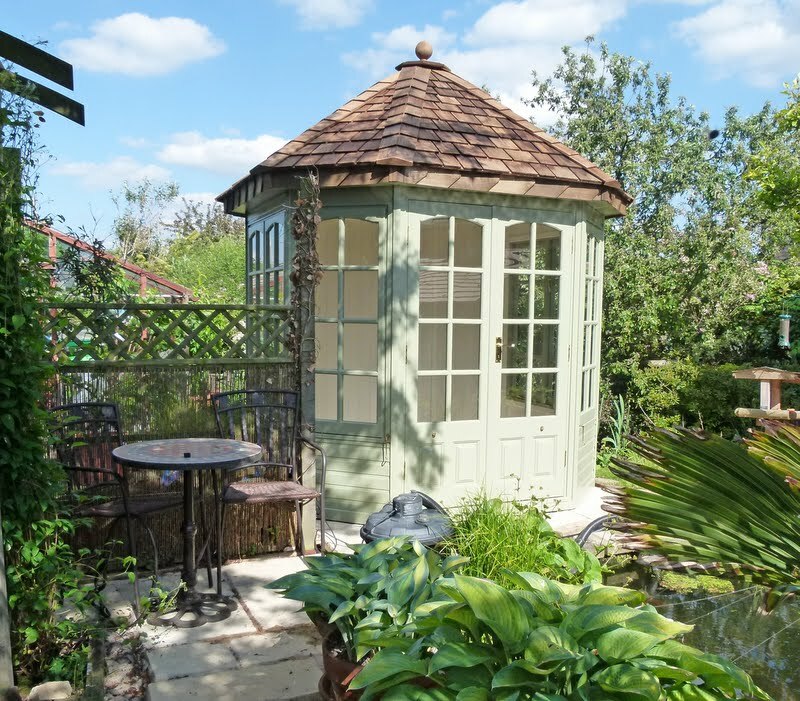 Yesterday was 'S' day - in other words it was the day that the summerhouse arrived and it seemed that it couldn't wait to settle into its new home. At 7:30 in the morning the knock came to the door announcing the arrival of the construction team - I wasn't even dressed but fortunately Martyn was up and ready! By the time I got downstairs (and I wasn't very long) the work had started. So I sneaked upstairs to take a quick photo. We were a little concerned that the size of the summerhouse would dominate our garden but everything seems to be in proportion. Now all it needs is to be furnished - we resisted the urge to sit on the floor to eat our dinner last night - and the area surrounding it needs finishing off. Do you remember that I was pondering whether I could move an established camellia? It was planted 11 years ago. I know that for certain as friends at work bought it for my birthday (a special birthday!). The problem was that the camellia dominated the view from the patio windows and also partly blocked the steps which lead up onto the lawn. Note the past tense! So have I moved it? Has Martyn been at it with the loppers as he did the other camellia? The answer is no on both counts but there has been some judicious trimming. This view was taken from a bedroom window before trimming. The pine on the opposite side of the steps and the bottom leaves of the palm at the top of the steps were conspiring with the camellia to make it almost impossible to use the steps. Even the dog was avoiding this route although I don't think she liked negotiating the dropped flower petals either. When I commented in a previous post that I was considering moving the camellia, Tanya at Allotments 4 You suggested that it may be easier moving the steps but as you can see from the photo, this wasn't an option! In the end compromise was the order of the day. 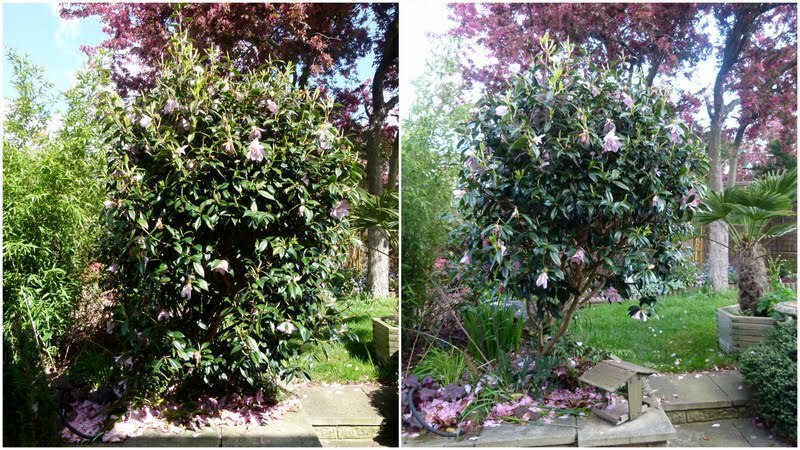 I usually give it a trim once the flowers have fallen as it is at this time that the camellia suddenly puts on a growth spurt. It may be a coincidence but I've also found that pruning at this time means next year's flowers aren't sacrificed. She's been given a general trim although there are still a couple of bits at the top that need attention. I couldn't reach them so if I dare let Martyn have the loppers maybe he'll reach them for me. Then I decided to give her a slightly shorter skirt. If you imagine sitting at our dining table, the view under the skirt is at eye level and so the bush doesn't act as such a blockage. The pine was also cut back and the bottom old leaves of the palm were removed. Ideally the palm could do to move slightly to the right but logistically this isn't an option. The bare area in the middle of the pine is starting to fill up now that I have removed the old solar light that had gradually been swallowed up. Knowing that this would leave a hole stopped me from removing it earlier but in the end it had to go. Now the camellia has put on some new growth it doesn't look as blobby and it hasn't undone all my work too much as I allowed for a bit of growing space. I think from now on this will be an annual job. We have lots of ferns dotted around the garden in various stages of 'unfurlment'. They always fascinate me as the croziers form so I decided to go on a fern safari around the garden shooting here, there and everywhere with my camera. I've tried to add names to some of the ferns but most were bought during our less organised phase when we didn't take note of the varieties. I scrabbled about and found labels on some but for others the labels had either long gone or the relevant piece of label had snapped off. I doubt that anyone can help identify them at this stage maybe later I'll post some photos of mature plants. You may not be able to tell from the photos but lots of the ferns are roughly planted in pots. I've been gathering them together from around the garden as I have plans for them but more of that in a later post! You wouldn't believe it but since I took these photos I've spotted even more ferns hiding amongst other plants as they unfurl showing themselves. Well to be honest the box isn't completely ticked but we have tidied up and made a start on planting one of the beds alongside the pond. The bed is almost at my eye level when approached from one direction and so I thought that it would be an ideal place in which to plant short rockery type plants. As a result each time I visited a local (well local to my sister), nursery, I have been collecting suitable plants that caught my eye. I still need one or two more but I figured that if I spread out my purchases they shouldn't all be at their peak at the same time. Some of the plants had been sitting outside of the greenhouse in pots for a while and so I thought that we really did need to make a start before they spoiled. The first job was to clear the bed of unwanted plants, some to be given away and others to move elsewhere in the garden. We did retain one plant for this bed, a small astilbe - chinensis pumila. It may seem an odd choice but it has lived in this bed for a while and seemed to like it so hopefully it will be happy. Then there was the problem of an old conifer root. Martyn used a pickaxe to try and remove it but was restricted by the proximity of the surrounding walls. In the end we had to compromise and leave most of it in place. I did suggest that we carve it into a little owl or something but that didn't go down too well! We had some pieces of stone that have had various 'lives' in the garden over the years. Their most recent life has been to create a second level to this bed. The soil had already had grit added but we needed to top up the levels with more soil and grit. Then all that was needed was to plant out the new occupants. Hopefully some will eventually trail across the top of the wall. One or two more plants will be added when I see something that I like and then we just need to decide on some sort of pebbly mulch. See what I mean about eye level - well that is my eye level. Must buy a clay saucer for that hosta on the left! I also intend to move the self sown hardy cyclamen growing on a lower adjoining ledge and plant in a similar way - hopefully in the not too distant future. At last the weather has turned spring like and we have managed to put in another two afternoons working on the plot. You may not believe it but one afternoon was spent clearing and tilling more beds and there are still areas in need of clearing. The second afternoon (Tuesday) we actually started planting and it was mainly the pea family that we concentrated on - both edible and decorative. Seeds had been sown in pots and the plants were desparately in need of planting out. We planted garden peas - Meteor and tall mangetout - Carouby de Maussane. We grew Carouby de Maussane last year and it didn't crop a single pod but as last year was a poor pea year (for us) we are giving it a second chance. We planted five varieties of sweet peas, four varieties (varieties are listed here under 8 & 9 March) are tall growing and one - Snoopea is a shorter variety. We never intended growing so many varieties but we ended up with a couple of free packets of seed, hence the sweet pea overkill. What is more when we came home, Martyn found a tray of another variety that we had missed. Our house is going to be very sweet smelling this summer. It's a good job that we don't suffer from hayfever. We also planted out a block or celery and a block of celeriac. We haven't managed to grow these successfully in the past so this is just another attempt - maybe not the best year for it. Our last task was to sow some wild flower seeds at one end of the bed where we will plant our dahlias. As always I wandered around with my camera to capture the moment and have posted the photos in the album below. Positives include potatoes pushing through, parsnips starting to germinate and lots of promise of fruit on strawberries, raspberries and other soft fruit. On the down side despite lots and lots of blossom, it doesn't look as though we will have much of a cherry crop. Such a disappointment as we LOVE cherries! Oh well there's always next year! It's not all about flowers. 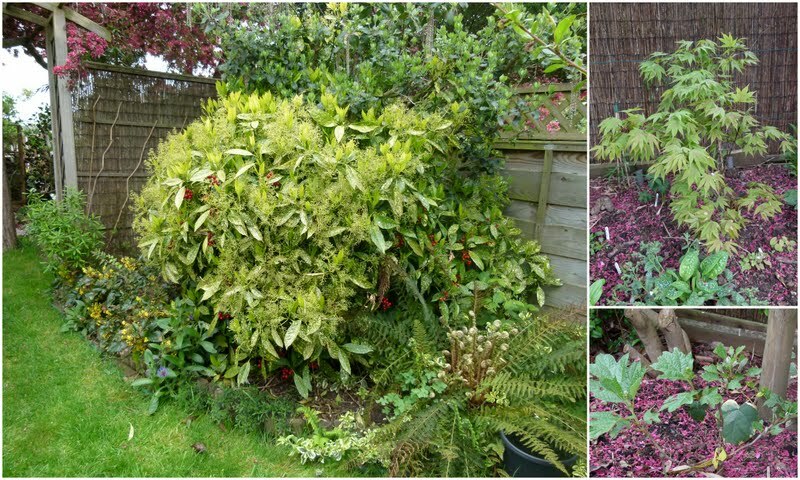 Looking round the garden, as you do, checking what is growing, what is flowering and what is still hiding underground possible dead, I noticed just how much interest and colour is being provided not by flowers but foliage. 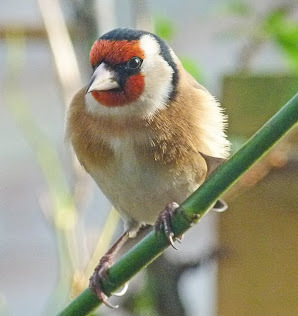 It seemed a cue to get out the camera and go round the garden collecting photos. I knew there was lots of leaf interest but the number of photos that I managed to take surprised me. I've collected them together in the album below and even then I haven't included all the ferns maybe another time. I don't know whether you are having the same problems as we are in deciding which type of compost is the most reliable and gives the best results. We're still finding that different bags of the same brand of compost produce variable results. Last year we had tomatoes growing in two identical grow bags. These were in the plot greenhouse, grown under identical conditions but whereas one lot grew as expected the other lot were weak and stunted. I wrote to the producers who replied saying their mixes were all thoroughly tested etc etc. but sent us a voucher to buy more compost as way of a goodwill gesture. I'm not sure testing formulae can detect all problems as the raw product can be variable. For instance some brands use green waste. Where does this actually come from and is there any possibility that ingredients that shouldn't be there have sneaked into the chain? I would guess that much of what goes into council green waste bins is suspect and not everything will be removed by the processes used by the composters. Another issue appears to be that composts run out of steam as the nutrient level is either poor to start with or isn't very long lasting. I also read somewhere that if there are pieces of twigs or wood in the compost that as these decay they deplete the nitrogen levels in the compost. I can't say whether this is true maybe someone else knows. Then there is the issue of texture, some compost is very coarse and others more the texture of dried grass clippings. Some bags of compost have even been found to contain bits of plastic and even glass. We are watching the Scottish gardening programme Beechgrove Garden with interest as they are carrying out another compost trial this year. (If you have Sky you can watch this even if you are outside of Scotland). They carried out tests last year with disappointing results but so far this year things seem to be going better. I suppose this year it will be difficult for us to know whether poor germination and subsequent poor growth is as a direct result of poor compost or poor growing conditions. Lots of gardeners advocate making their own composts but we just wouldn't be able to create enough and then there is the prospect of growing lots of weeds amongst the seedlings. We use lots of compost and so cost is another consideration as is availability - we don't want to have to travel miles just to buy compost. Just out of interest I thought it would be interesting to carry out a little survey about what composts people have found to be good or on the other hand to be rubbish so if you have a few minutes to spare will you post a comment describing your experiences? The garlic planted on the plot was slow to get going and spent a short time enduring snowy conditions. Up until February the outdoor this garlic was looking battered and bruised - whereas in contrast that growing in the greenhouse looked very sturdy. Since then all have been left to their own devices. 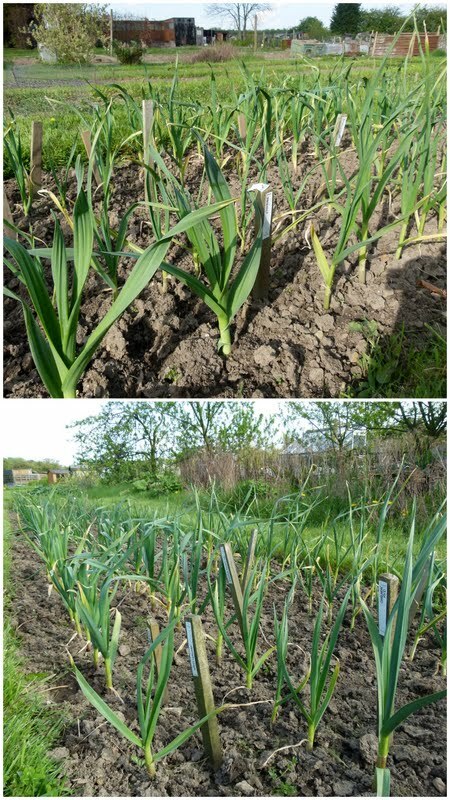 Then at the weekend I decided to hoe around the autumn onions and outdoor garlic and took the opportunity to assess what has happened. What a turn around! The garlic planted outdoors has shot up and it looking very strong and healthy. The sturdy looking plants in the top photo on the left are elephant garlic but all the plants look good. There were one of two cloves that seem not to have grown but very, very few. The garlic planted out still looks as though it will produce but dosen't look as sturdy as that planted directly outdoors although every clove did grow. That leaves the garlic planted in the tubs in the greenhouse and moved outdoors to continue growing. Again this is still growing and should crop. So what are my observations at this point? If I had to choose I think the garlic looking the best at this point is that which was planted straight outside. However, there are some facts to take into consideration. We had a dry winter so the outdoor planted garlic was less likely to rot and it is this rather than the cold that is likely to be a problem. On the other hand the garlic grown indoors suffered quite a set back when it was moved outdoors as the weather has hardly been seasonal. These plants were subjected to heavy rain and winds almost immediately after transfer which would have been a shock to the system. The garlic in the tubs being a bit more sheltered in the garden that that planted out on the plot. The next test will be when the bulbs are harvested. Anyone anything to add for your experiences? We have quite a bit of rhubarb at the moment so I was browsing the Internet for some different recipes when I came across one for Rhubarb Crumble Muffins. The recipe was on the BBC Good Food site which I visit quite a lot. This site has a search facility which allows you to search the recipes in various ways such as, in my case, for recipes using rhubarb. The recipes are gathered from the cookery magazines published by the BBC so rather than buying a magazine, in which there are probably more recipes that you are not interested in than that you will ever want to cook, everything is available freely online. Another thing that I like about this site is that visitors who have tried the recipes can grade them and also make comments. The Rhubarb Crumble Muffins scored top marks - 5 stars - and didn't receive any negative comments. Some visitors also described variations that they had made to the original recipe which I also find very useful. Most suggested that the recipe needed double the amount of rhubarb so I decided to go along with that which proved to be a good move. I also substituted the buttermilk with low fat Greek yoghurt which I had in the fridge. Everything else I had available. The muffins took slightly longer to bake than the recipes suggested - mine took 20 minutes. Also the recipe doesn't really mentioned how large the rhubarb pieces should be - mine were about a centimetre square. We enjoyed one each at lunch time soon after they came out of the oven. They were soft and light will a crunchy topping. Our 'first course' for lunch was a sandwich made with some of Martyn's freshly baked breadcakes so was a joint effort. We've saved a couple of muffins for after dinner and the rest have been frozen to enjoy later. This way we won't be greedy and eat them all at once! We've had another busy weekend on the plot. When the weather allows, you just have to go at it like a mad person or in our case two mad people. It's the only way that we'll catch up. Although to really catch up we need some warm weather and no cold nights in order to encourage reluctant plants and seedlings to grow. Saturday was mainly a planting day. At last. Martyn managed to sow the carrot seeds and erect their protective home. Last year the dry conditions slowed down carrot growth but the weeds still managed to flourish. The consequence was swamped carrots and a very poor crop. This year we are using weed control fabric to try and give the weeds a bit more of a challenge. 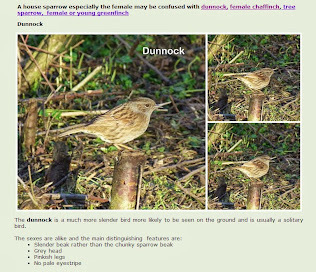 Martyn has posted in detail on his blog here. Whilst Martyn was busy dealing with carrots I planted out more broad beans. The ones planted earlier are looking a bit, (well to be honest a lot), worse for wear. It was tempting to pull them out but some have flowers so we decided to give them a chance. We now have three varieties planted. Witkiem Manita ( the poorly ones), Bunyards Exhibition and Red Flowered. After that I hoed and weeded the spring planted onions and shallots. After all the rain the soil had developed a crust but surprisingly there weren't many weeds. 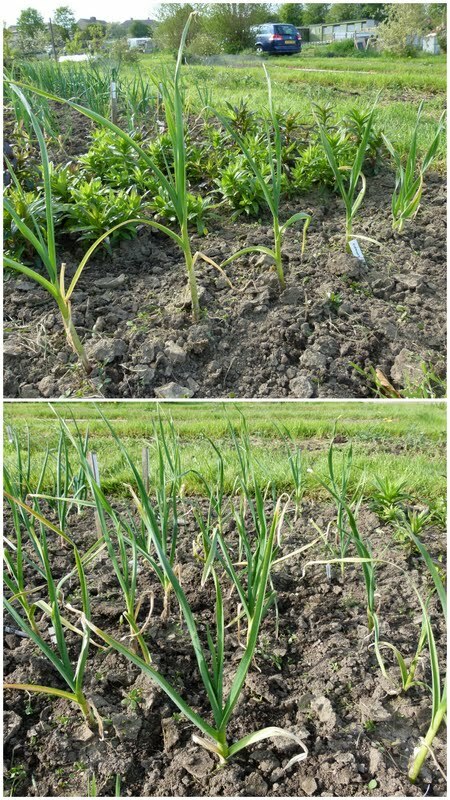 Onions are a priority when it comes to weeding. Once the weeds develop a stronghold it can be difficult to remove them without damaging the onion foliage or uprooting the bulbs. Also too much weed growth can cause it to be too damp around the bulbs. I also was drawn to our very overgrown autumn raspberry patch. The intention, this year, was to dig out all the raspberries, dig over and fertilise the patch before replanting the raspberries. As this intention is unlikely to be carried out this year, I contented myself by tidying it up. Once the canes grow a bit more, I'll thin them out. Sunday was another tidying day. Martyn strimmed three fifths of the plot and tidied up some of the edging. (I wish the vegetable plants were growing as well as the grass is). 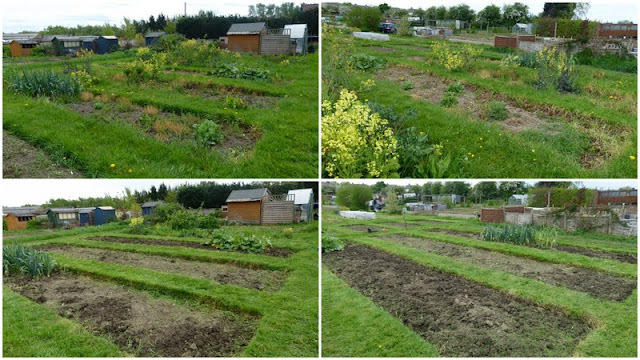 We also both tidied up some of the beds in an area of the plot that had so far been neglected. More shock photos for those who think our plot is ultra tidy. It is getting there but we still have a few beds that are in need of concerted attention. Befores above and afters below. It was strange how in some parts of the beds the soil was soggy and in others easy to dig. Now the beds are ready to be tilled and planted - that is if anything grows well enough to be planted - what a year! After thought: Some potatoes are just managing to peek through the soil so no frost now thank you! For some reason hostas feature highly on slug's and snail's menu of favourite food. 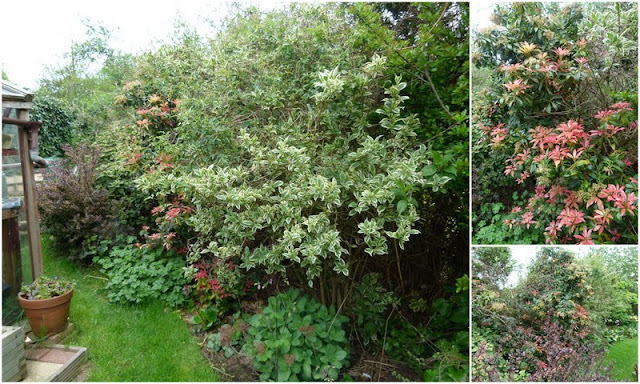 The problem is that they also feature quite highly on my list of desirable foliage plants. The key word here is foliage - I know hostas also have attractive flowers but their main claim to fame is in the leaf department. So the battle is on to protect our hostas from the rasping mouthparts of the hoard of slimy molluscs intent on crafting lacy leaves as a by-product of their overnoght feasting. Due to our poor weather conditions I was a bit late in my hosta protection regime and some of the young shoots had already been set upon but I am hoping the belated preventative measures will call a halt or at least slow down the devastation. When it comes to protecting our hostas I try not to put all my faith in one method of protection - I don't even rely on just belt and braces. It's a case of belt, braces, sticky tape, elastic bands and anything else I can think of. Planting hostas in open ground in our garden would be a total waste of time and so they are each planted in a large clay pot. These sit on the wall around our garden pond and double as weights to keep the heron deterrent in place. Some plants, that had been moved from wooden planters that last year were sitting on our patio, were potted up and others had the top layer of compost refreshed and slow release fertiliser added. After removing any nibbled shoots, my attention turned to the serious matter of setting up the defences. A circle of copper tape was stuck around each pot - this is supposed to deter slugs by administering an electric shock to any mollusc that tries to cross it. Just in case any slugs were already lurking in the compost or we happen to have some that quite like to go tingly, I have surrounded the shoots with something called Slug Off. It's a granular material which is supposed to absorb mollusc mucus which they need in order to slide along. I first used this around some pansies last year and it seemed to have some effect. A ring of petroleum jelly was smeared around the pot as again slugs don't like to cross this substance. As the plants are watered (or as the rain continues to fall) the saucers holding the plant pots fill with water which also provide a barrier that any mollusc without a life jacket shouldn't be able to cross. The next precaution will come into effect once the leaves unfurl. If the leaves touch anything that a slug or snail can climb up then abseiling molluscs will gain access that way. Maybe I'll apply some organic slug pellets too! If our hostas do fall foul of slugs and snails then at least I'll feel that I have tried my best. Not long now before our summerhouse arrives, so whilst I was busy dealing with hostas, Martyn was working on the base which can be seen in the photo below. Does anyone have any other effective mollusc deterrents other than night time collections _ I really would like to leave that to the hedgehogs. One method my sister used, last year, to protect pansies in containers was to mulch around the plant using poodle wool and that seemed to work too. Has anyone used the new wool slug pellets? At least something is looking as though it will crop! I know I've gone on a bit about fruit lately but to be honest with progress on the vegetable front being very slow it's really the main area on progress at the plot. I mentioned strawberries and the kiwi in my last post but they aren't the only fruits that are making progress. I am happy to report that fruit has set on the pear trees. Despite the terrible weather the plucky little pollinators must have been doing their stuff. Maybe the bees put on an extra woolly jumper. 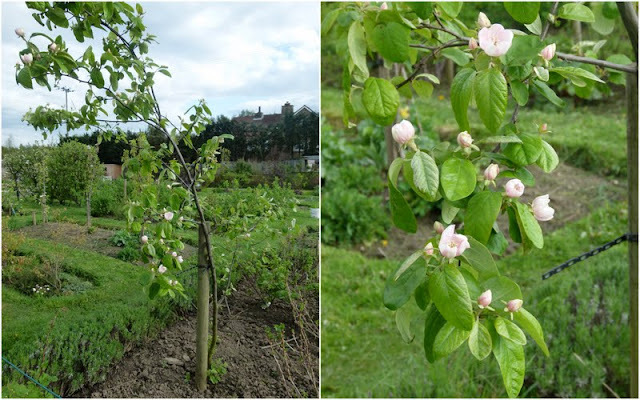 Let's hope they stick around to start on the apple trees that are now in full flower. I hope those of you who keep thinking our plot is very neat and tidy have noticed the weeds! The quince flowers are just beginning to open too and this year there are lots more. The tree is in its third year so maybe due for a reasonable harvest. Here's hoping! 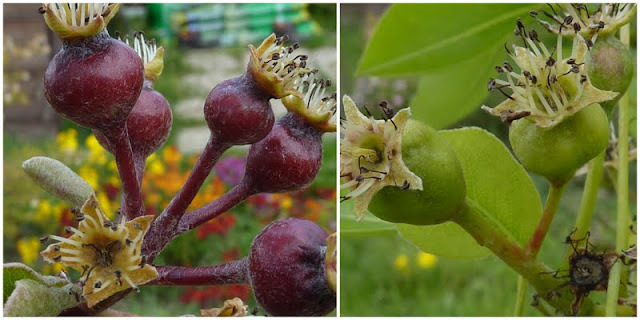 If all the flowers do set fruit I guess I really ought to do some thinning but will I be able to bring myself to do it? It's a bit too early to tell how much of the cherry blossom set well but there are the tell tale green mini fruitlets showing in the centre of some of the faded blossom. The rhubarb is thriving so lots of pies, crumbles and tarts! This is just one of our rhubrab patches. Looks like we will be grateful of all the rhubarb as the plum and greengages have stayed true to their inclination to crop biennially. We are paying for large year's bounty by a very lean year. Maybe the word lean is too optinistic as I couldn't find any signs of fruit having set! What do ALL the trees crop the same year though? It's not as if they were all planted during the same year. Bush and cane fruit are also doing well but that is for another day! 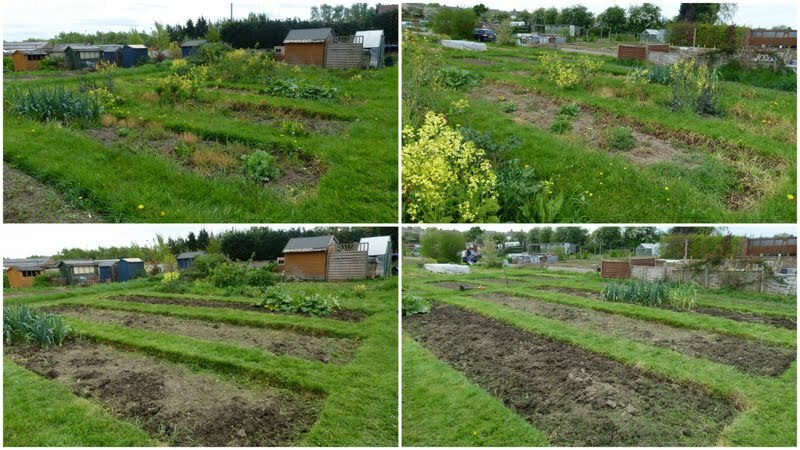 Well despite being a bank holiday weekend the rain stayed away and as a result we manged a couple of productive afternoons on the plot. I say productive although I suppose that isn't really the right term as we didn't really produce anything other than tidy beds. For those of you who keep telling me that we have a tidy plot prepare to be shocked! 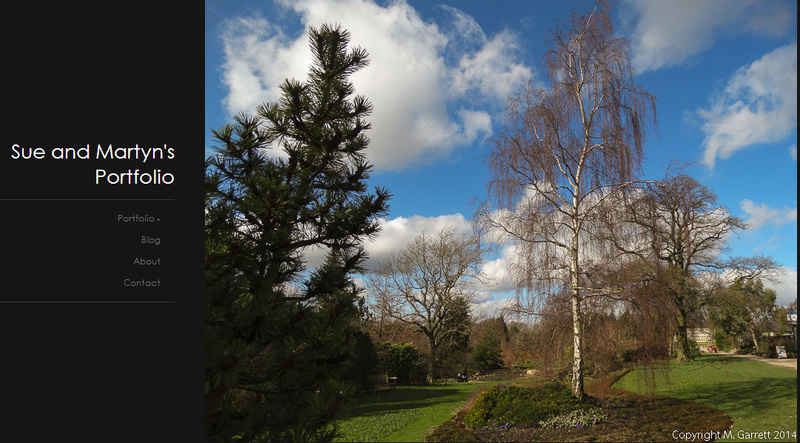 On Saturday we both set to and removed all the weeds (including self sown poppies and foxgloves from a couple of beds. Below are the before and afters. A couple of the larger foxgloves were transported to the garden. I used to sow seeds each year but now I content myself with moving self sown plants into the places that I want them rather than where they want to grow. As for poppies - they should come with a health warning although I didn't even plant any in the first place - I must remember to remove the dead flowers this year of plants that escape the weeding process before they pepper their seeds far and wide! 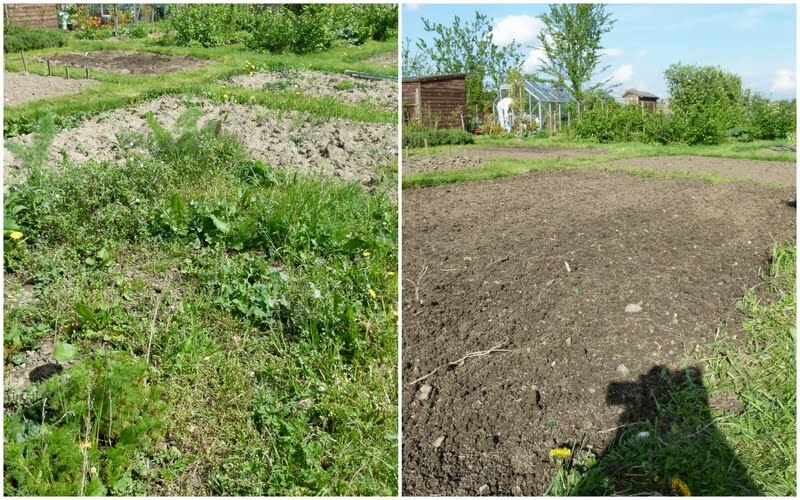 Sunday Martyn tilled these two beds whilst I weeded another one. 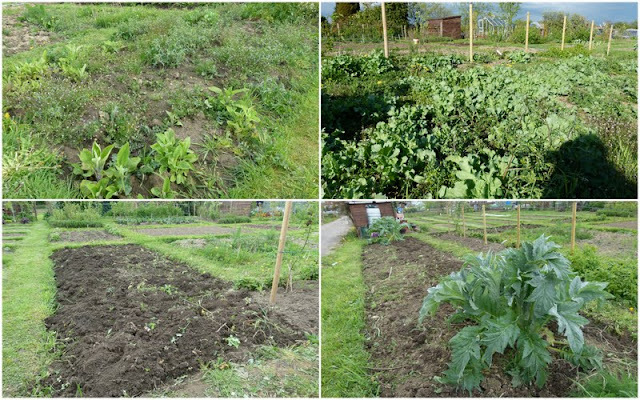 This bed was a bit harder to deal with even though the worst of the weeds were just confined to a quarter of the bed. We had started clearing here in late autumn and been forced to abandon it as the awful weather set in. Martyn cleared another couple of beds that only had a sprinkling of weeds and then tilled this area. So now we have one part of our plot looking tidy - all it needs now are some seeds and plants. As Martyn completed the tilling I hoed round the strawberries where the rain had compacted the soil. I also hoed and weeded around the autumn planted onions and garlic. The spring planted onions could have also benefitted from hoeing but I ran out of time. We even managed to sit outside the shed and have a couple of coffee breaks enjoying the scent of the wallflowers! The bellis were still looking good too. In my last post I updated on how the flower bed at the front of the house is performing but things are also on the move in the back garden too. I posted earlier about the crab apple - Malus Profusion dressed in its best clothes. Although lots of the blossom has fallen it is still hanging on to its flowers although the deep pink is fading a little and the bed beneath the tree is scattered with dark pink confetti which you can just make out in the picture on the top right. 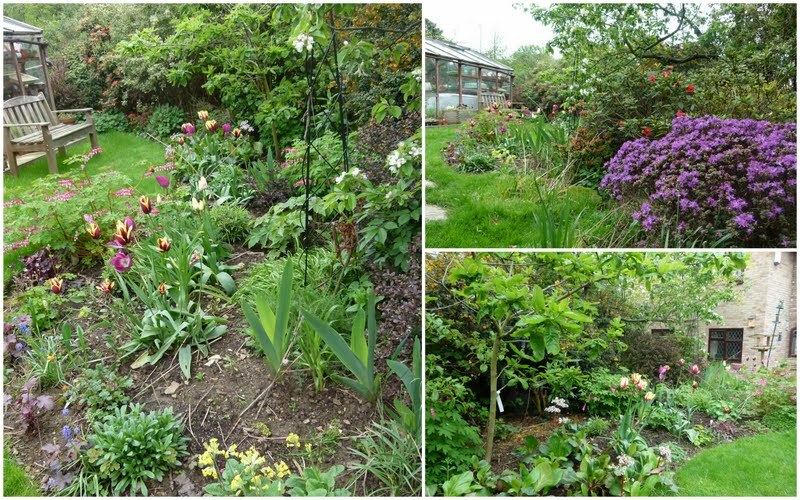 The photo bottom left shows the marsh marigolds and water hawthorn flowering in the pond behind which, if I had allowed, you would see a scene of fairly total devastation where the summer house will be erected. 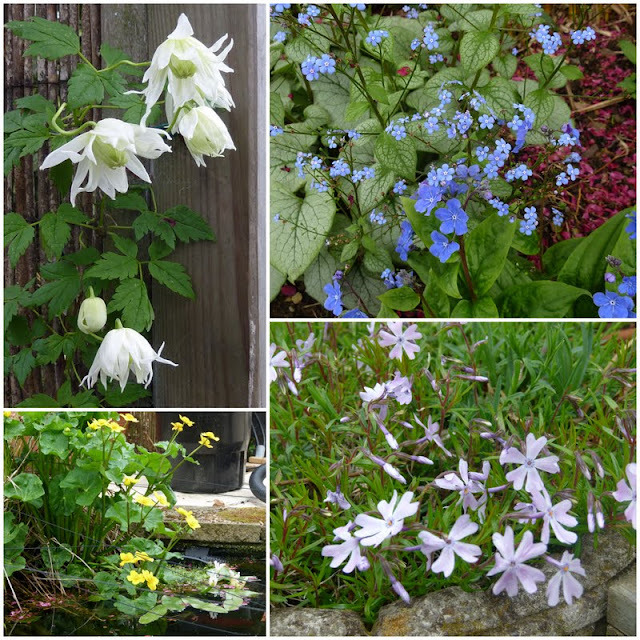 Bottom right is phlox subulata - Emerald Cushion Blue which is planted in a stone planter. Our other crab apple tree - John Downie is now flowering. Under its branches is another flower bed which although not a well 'covered' as the bed at the front of the house does have some splashes of colour. It's not only the flowers that are providing colour though. The flower bed above meets a shrub border which you can see at the top of the photo on the left. Although this border is in line for a little bit of renovation work at the moment the shrubs are also providing some welcome colour, especially the pieris - Forest Flame. This small bed is separated from the new blue and white bed by the wiilow screen and at the other side of this the new acer and hydrangea quercifola are growing well. 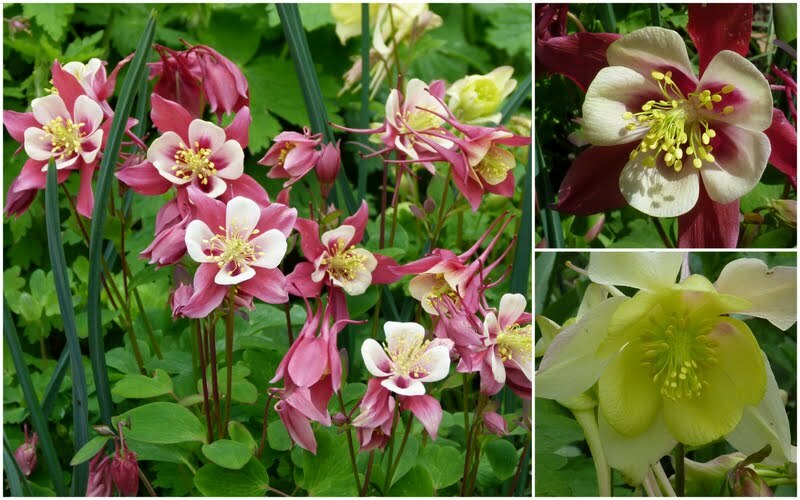 If you would like to see larger versions of the photos I've added a photo album with extra photos on my May diary web page - let's face it there wasn't too much else to add to gardening activities for the beginning of May! At least some things don't seem to mind this awful weather! As there is not much happening on the vegetable front, other than seed sowing and waiting, I thought I'd cheer myself up by posting about progress on the flowering garden front. The perennials that I planted last year in front of the house are really shooting along. I'm planning to add a few annuals into any gaps in the planting but at this rate maybe I won't have any gaps! The mini daffodils - Pipit - at the back of the photo have been flowering for ages. Although they are beginning to look a bit ragged now, it seems that they have enjoyed the cooler (no let's not understate this - cold) conditions. I had planted few heuchera - Plum Pudding temporarily on the plot. A couple were split up and planted as edging plants and have really taken off. It's surprising how easy it is to grow heucheras. Even a bit that has hardly any root seem to grow. I suppose this is the reason whyI usually end up with too many for the garden. Also on the plot I found three self seeded verbena bonariensis. These were dug up and kept in pots in the greenhouse over winter and have been planted in gaps - they can't be seen in the photo yet so you will have to take my word for it, that they are growing well. 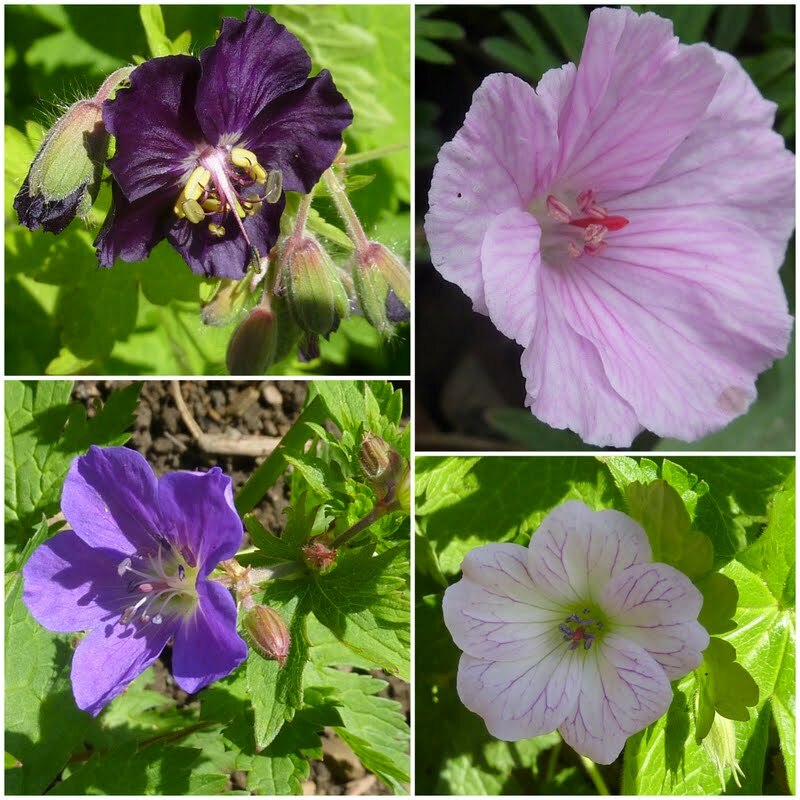 The geraniums that I planted last year have made really good growth and are beginning to produce flowers. But the star of the flower bed at the moment has to be the aquilegias that I grew from seed last year. Not all of them are flowering yet but the ones that are look beautiful. Diana at Kebun Malay-Kadazan Girls has just found out that another blog is stealing all her posts. This blog is posting Diana's work as if it is their own! If you have a blog then it is worth reading the post in which Diana has described her experiences. April ended on a high!